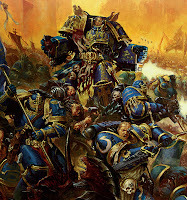 So I follow the rumors, as do we all, for codex releases as it is nice to start thinking about how that will affect your armies and the 'meta' for lack of a word of the game. GW has been on a streak now of rapid fire release which is overall great. Nobody likes being stuck with an old dex, nor do we really want to see the game stagnate because releases are far and few between. The marine rumors are full tilt now, and a lot of information over the last few months has been accurate so likely most of this is all pretty true as well. Now I'm pretty vested in this dex currently. First I have Black Templars which are going to be rolled into the book. Then I have my Imperial Fists army which is a tank based marine army. Then I have my bike army. So that's a lot of points and models that I have to see what I can do. Aside from the Templar dex dying a sad death, and Imperial Fists looking like they aren't supposed to be a tank army, there is one other giant nugget in the toilet bowl for me. "1 Bike squad of at least 5 models (of which one may be an attack bike) may be taken as a troops choice per Captain on a bike in your army." So that pretty much just kills the C:SM bike army. It was a fun run, but it seems GW has decided to just kill of that option from the marine dex for a full bike army. Even Khan only seems to unlock one small unit. So thanks GW. I thought when you killed my Descent of Angels list with 6th edition that was pretty sweet, but at least I could still use those models in a terrible list I suppose. Now I just have a ton of painted bikes and can't actually make a full bike army. Well that's not entirely true, as FW clearly wants the all bike army to be one codex only. Back when the DA dex was coming out I was working on my bike army and I knew that Ravenwing could possibly be the way to go. I gave it a game or two of play testing, but I figured the tradeoffs were minimal and would require painting even more bikes and lose all those attack bikes I have grown to love. But now it seems my options are pretty limited so I've got to jump in if this army is going to move forward. There are of course several questions that I don't know how to best address. How do we handle fliers? I had found a unit of sterngaurd in a pod was a great way to put pressure on the enemy, but DA have no sterngaurd? What about adding terminators, can the hybrid work? So I've been thinking about it and tossing around ideas. First off at smaller 1500 pt games you probably just take Sammael and run a bunch of bikes and try to shoot your way to victory the best you can. Anti air for DA is terrible. Basically I'd have to shift the bikes to Melta to be able to really take care of armor, and hope the twin linked plasma of the command and Black Knights can deal with fliers and MCs. The Banner gives the Ravenwing the anti infantry punch, and the meltas are really just back up for vehicles. I even kept two Attack bikes in there as a bit of throw away units you could hide for objective grabbing or perhaps outflanking against some opponents. Is it good? Well probably about as good as my 1500 point marines. I don't know if I'd say it is better. But the problem is the amount to paint. Essentially I need Sammael, the 10 Command Squad/Black Knights, and 6 melta guns. I actually have about 7 bikes unpainted, so purchase wise it isn't a lot (I can convert the plasma talons). It's just the painting more bikes I was never excited about really. More Plasma and Corvus hammers, a big FNP banner, and one more troop. And 11 more bikes I'd need to buy paint. It makes me cringe a little. So what if we take a look at what else this book has to offer which is unique. That's really quite a bargain. You can upgrade to TH/SS which makes them more expensive, but that upgrade is going to hit normal marines soon as well. There are other upgrades you can take but the Cyclone Missile Launchers are hard to pass up on now. Like Ravenwing they need a special IC to become troops. This mean Belial or Azrael. I would say the both have some pros and cons, but if I'm looking to mix the Ravenwing in then Azrael seems the way to go. 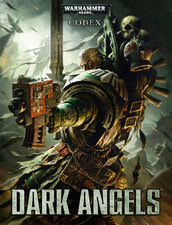 Sammael is certainly a nice character, but he doesn't 'make' the Ravenwing army that much better. 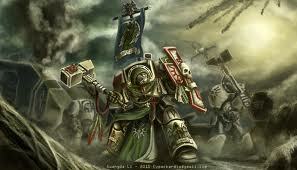 Azrael biggest negative is he is not Eternal Warrior (where as GW figured T5 Sammael should have it I guess), but he has a few cool things beyond unlocking both bikes and termies as troops. He's got the Chapter Master stat line with the boost to a 2+ armor, plus with his 4++ and 6+ FNP that is pretty nice. His sword is Str 6 AP3 which is handy but not great, and he's got a master crafted combi plas that can Blind. But the big thing is he confiers that 4+ invul save to his unit. This is why we see him walking around with IG blobs, but that's not going to be my plan at all. He can't go with the bikes, and if the termies plan to deepstrike (hopefully off of bike telehomers) then he can't go there. It's too bad DA don't have sterngaurd, but I'm wondering if I could make vets do in a pinch. So the dream scenario is to go first, scout the bikes forward, and have 2 combat squad termies drop down and the drop pod. The drop pod is now you 'need to kill a tank dead' unit, and with a 3+/4++ you hope they can stay around and cause problems. The two termie combat squads can shoot at two different targets, so you can figure out how to shoot at 4 units with that 10 man squad (with rerolls turn one). The bikes work on anti infantry, light tanks, and MCs as needed. The list isn't without problems of course. You start seeing 2-3 ion riptides and you are wary to deepstrike down unless you can get damn close or good cover maybe. Flyers, in particularly helldrakes, are still challenging. Multiple AV14 makes me think I might want to trade a few plasma guns for meltas. It is also not a ton of models especially if you are going second. They are all pretty resilient I suppose, and this doesn't quite fall into completely elite, but every death is going to hurt. The good news for me is I would have to finish painting/converting the command squad (which clearly needs to happen if I'm every going to use a bike army again anyway), and I could repurpose some unpainted Templar termies for this project. Beyond that pick up an Azrael like model as my only purchase to start play testing this. So it is great that I can use most of the army I already have (11 attack bikes and a Storm Talon ready to collect dust) and don't have to go buy a ton to do this. Most importantly though I think this could be a fun list. It gives you some options and it has some flexibility. This is the one thing that playing my Tau does not have. You stand and shoot, and weather the return fire. It is boring. It is still a great army, and probably better than this one... but yawnfest 2013. Of course the Marine dex could have plenty of goodness to keep me off of doing much more than play testing. The Tau army is still good, and with some tweaks it is probably still my front runner for Feast of Blades.